At breakfast, we said good-bye to the other members of the Rick Steves tour group that we’d been traveling with for the past ten days and set out on our own. We left our bags at the hotel while we headed out for a day trip — with no guide! For much of the trip, Kris was tense. After ten days having a guide directing most of our moves, suddenly we were on our own again, having to figure out train schedules and transfers. She didn’t like that we didn’t have definite answers to our questions as we made our way. But you know what? It all worked out just fine! All trip, Kris and I craved cats. This cat at Ostia was very friendly. Ostia was the harbor city of the ancient Roman empire. (Antica just means “ancient”.) For over a thousand years, Ostia was a thriving city. But in time, it fell into decay. Eventually, they city was abandoned, and slowly covered by sediment from the River Tiber. The ruins have been recovered now, and this little-known site is now considered a better example of an ancient Roman city than Pompeii. 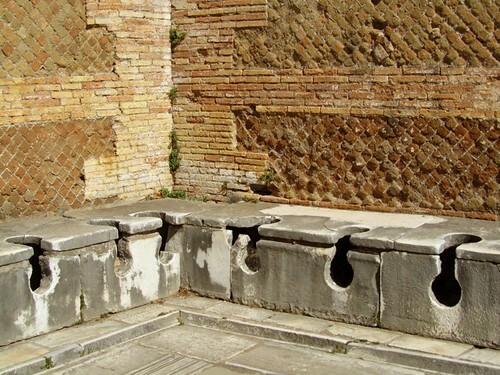 Roman latrine at Ostia Antica. Note the lower hole, which is space for a “sponge on a stick”. After touring the ruins, we took the train back to Rome, where we ate a large lunch (cheese plate, steak with salt and rosemary, and a liter of wine), then collected our bags and returned to the Termini Station. There, we spent a few hours on the platform, waiting for our train to Paris. I wandered the station, reveling in the feel of it all. Our train trip was mostly uneventful — it grew dark soon after we left Rome, which saddened me. I wanted to watch the countryside go by. This video is for my nephew Noah, who loves trains. In my defense, I think JD is exaggerating my tension during this trip, although I did have a minor meltdown on the train. This is also an opportunity to point out that before our entire trip, several women warned me that restroom facilities in Europe rarely come with toilet paper and often required payment. I found this to be untrue, except for this day– perhaps because we were off the normal tourist track. No paper at the train station at Terminal B, no paper at Ostia Antica, and pay restrooms (requiring exact coinage) at the Rome Termini station. No worries, I was prepared for all circumstances. Wow! I hope that Kris is eventually able to find her zen with travel — generally chilling out will let you both travel much more affordably (no group trips, more affordable places to stay, etc) and have much braver adventures. There’s truly no point in stressing while traveling, because things always (or almost always) work out just fine. And even when things don’t work out as planned, with the right attitude, you’ll end up having just as much fun anyway and just having an unintended adventure. Everything with travel can be a great adventure. Getting lost can mean wandering without plans and seeing all new stuff. Missing a train can mean having extra time to see something else, meeting locals while figuring out the next train, etc. My suggestion: pick a slightly adventurous country (Vietnam? Cambodia? Ethiopia? Ecuador?) and go totally on your own as a couple, talk to “backpacker” type travelers before you go to figure out how they do it, take a Lonely Planet along, and you’ll have an amazing, affordable trip with more fun than you’ve ever had before. Being in a slightly challenging country with lots of chilled out travelers might be just what you need to kick you into zen-chilled-out-travel-mode where you enjoy the sights, enjoy things as they come, and let go of the neurotic plans, groups, schedules, etc.